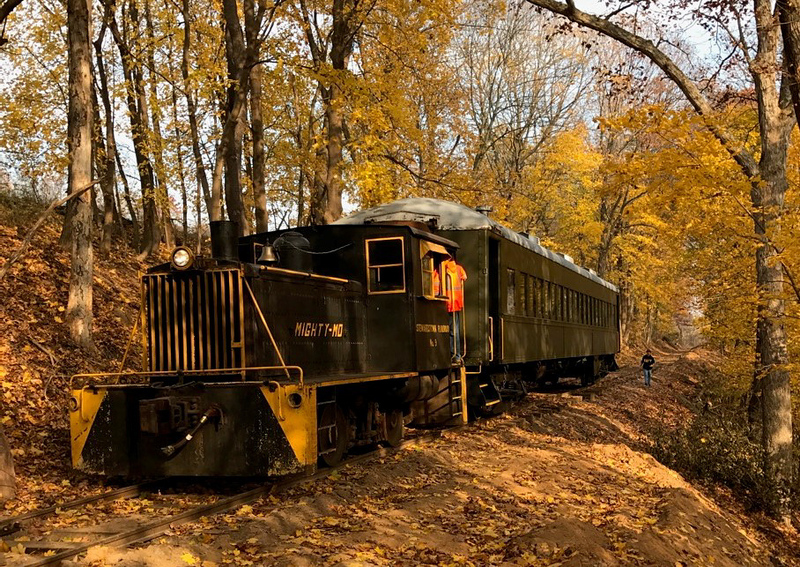 There is a hidden treasure situated just north of the Maryland state line and 42 miles outside of Baltimore, the Stewartstown Railroad. This short line has been in continuous existence since 1884, constructed primarily to serve local agricultural interests and the small town for which it is named. The 7.4-mile system's lone connection was with the Pennsylvania Railroad's Northern Central main line (Baltimore-Harrisburg) at New Freedom. Surprisingly, despite its size the little railroad survived as a freight hauler long after World War II. Then, in late June of 1972 severe flooding throughout the Northeast, due to Hurricane Agnes's remnants, crippled the region's railroads. Included within this devastation was then-Penn Central's Northern Central corridor. As a result, according to Trains Magazine, operations over the Stewartstown were also suspended since it could not interchange . The railroad did not resume service until 1986 at which point its remaining customers had either switched to trucks or went out of business. Afterwards, it operated as a tourist attraction until suspending operations again in 2004. Then, in 2010, a dispute began over a $350,00 lien owed to the George M. Hart, former president and owner. After the property was nearly abandoned, donors (some anonymously) stepped up and paid off the debt in 2013, which resolved the issue. The Stewartstown re-opened in the spring of 2015 and today continues to host excursions. The following was provided by Bill Histed. I am just one of the latest in a 133 year parade of good people who have fallen under the spell of the Stewartstown Railroad Company in Stewartstown, Pennsylvania. There is no other railroad quite like it. Of course, that is said of many railroads in our modern day of cookie cutter chain stores, look-alike restaurants, cookie cutter convenience stores an the like. Every railroad is different in some way--- the cities and towns served, the right of way, mix of equipment, history, and so on. Railroads are definitely not like overpriced fancy coffee houses or chain restaurants with 10,000 look-alike's where a chain steak house appears exactly alike be it in Portland, Oregon, or Portland, Maine. The Stewartstown Railroad is unique among the uniques. It is one of the oldest transportation corporations in the world still operating under its 1884 charter....same capital stock, same route and same name. Even much of its track is original from the mid 1880s, stamped, "Carnegie." That is before U.S. Steel became a legal entity? It's famous "iron bridge," since reinforced, was obtained second hand and built in the 1870s. 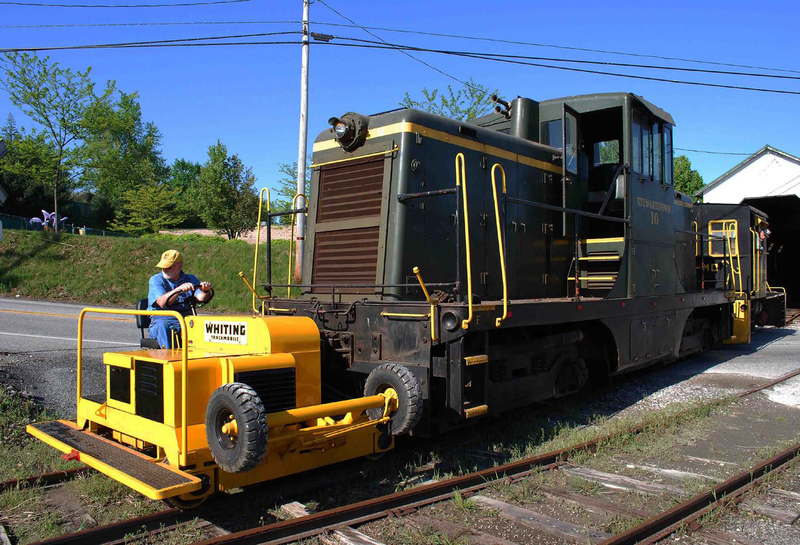 The official commonwealth website for corporations lists the Stewartstown Railroad as being in continuous business since 1884. The railroad is also known as "The Farmers' Railroad." When the larger railroads bypassed Stewartstown, a group of local citizens, area farmers and town leaders banded together to form the corporation with stock at $50 per share. That was a lot of money 133 years ago. There was a lot of love for the Stewartstown Railroad when it was built and there is love for this unique railroad today. This is not to say that the railroad has never had problems. One of the most recent, several year ago, involved a court battle over the estate of the railroad's late president, largest stockholder and well-known rail preservationist, George Hart. While he was involved in a number of railroad enterprises, including a passenger charter service, helping to establish a state transportation museum elsewhere, collector of steam locomotives and diesels, Hart's first love was the Stewartstown Railroad. 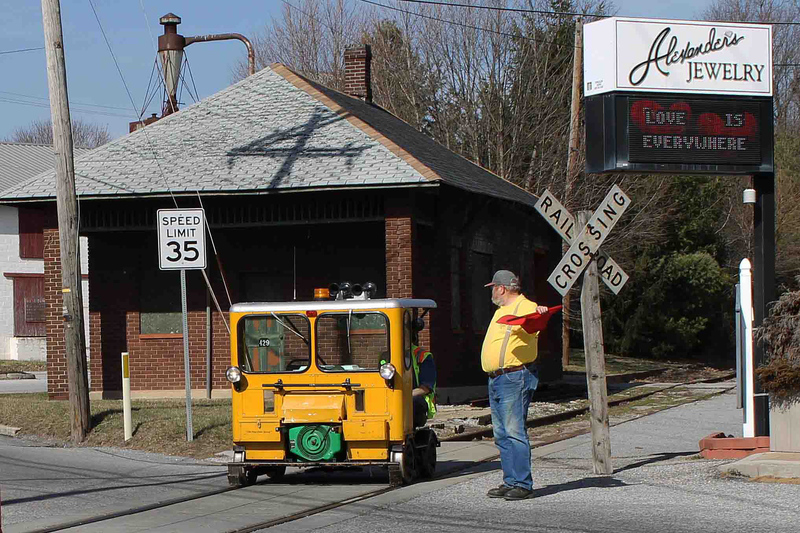 He was involved with the Stewartstown Railroad for many years, but as he got older, things changed and a fight with some of the board members ensued. He got bitter near the end of life, attaching some $350,000 in liens to the railroad, which he said money he had advanced over the years. He instructed in his will for the executor to rigorously enforce the liens. It's a long story, but the Stewartstown Railroad survived with some new people coming on-board to help financially. Today, the management and shareholders are a good mix of local people, folks from a distance who just couldn't hear of letting another railroad be abandoned and a true blue rail fan here and there who always love to help keep the fox out of the engine house. And the railroad does have a more than century old wooden engine house, perhaps the oldest in the country. The Stewartstown Railroad is a complete railroad, not just a branch line that was cast off from a Class I. It has had its own station, tracks, engine house, bridges (a bridge for every mile of track) and small yards. It is about as vintage as railroads get. Even before the Hart affair, the railroad has a long history of enduring difficult circumstances. In the 1970s when Hurricane Agnes hit the region very hard, causing its interchange partner, Penn-Central, to shut down the connecting line; the Stewartstown Railroad, however, never gave up. It kept up its equipment and began to rely more on weekend and holiday passenger runs to keep money in the till. Before that, the government began building modern roads and highways to directly compete with railroads. As passenger and freight traffic declined on the nation's railroads, the Stewartstown Railroad went to small gasoline and diesel locomotives which were less expensive to operate. Over the years, some well-meaning people gave the railroad the title, "The railroad that refuses to die." But management and the board felt that was a bit too negative. It is true, though, that the Stewartstown Railroad is truly one of the most notable survivors among railroads. How many railroads may say they have had the same corporate structure for 133 years? Most, today, are the results of mega mergers, bankruptcies, reorganizations or being spun off from some other company. There are currently 75 shareholder who own the railroad. At the "annual meeting," stockholders elect board members and the president, all for one year terms. Board meetings are held once a month in the station in Stewartstown. Some directors attend by teleconference calls. Stockholders on this day are treated as royalty. When the business meeting is over, everyone attending, stockholders and their guests, are treated to a meal by the railroad, and after that, a "stockholder and directors'" special train takes everyone who wants to go for a tour of the line. In 2017, the special went to New Freedom by motorcars and paused about 45 minutes for anyone who wanted to buy a snack or use the facilities. Some of today's stockholders are descendants of the first stockholders in 1884. The Stewartstown's very first locomotive as a brand new steam locomotive built upon order at the Baldwin Locomotive Works. Without any federal or state tax grants, the railroad has been busy improving itself since the Hart Estate matter was settled. Volunteers have kept the railroad going, from the company's management and directors, who receive no pay or monetary benefits, to junior conductor students who learn about railroading and railroad safety. David Williamson has served as president since Mr. Hart died. Management and directors include a surprising mix which includes a licensed civil engineer, a few business owners, a retired person, a CSX locomotive engineer who runs Amtrak passenger trains, veteran railroaders as Ken Bitten, and people of other walks of life. Track has been restored, though there is a long way to go to get the property to Class 1 standards all of the way to New Freedom. Work has been done on buildings, additional equipment and rolling stock has been obtained and renovated and the list goes on. This is not a retirement club, though retirees help and are important. Some stockholders and junior conductors include Thomas Stahl, age 14, and others, who greet passengers and do other duties. Always supervised by adults, the junior conductor program legs young people see the railroad close up. They are not allowed to operate equipment. It is great to see young people take an interest in trains. Most operating revenue on the Stewartstown Railroad comes from weekend, holiday and seasonal passenger ridges. Sometimes during the year, the public may tour the whole 7.4 mile line in motorcars, where they see the railroad from the bottom up. And the railroad seems a lot longer than that with the curves and grades through the rolling hillside in York County. The Stewartstown Railroad is very open with inviting the interested public to be involved. There is a separate not for profit "Friends Of The Stewartstown Railroad" which helps preserve the history of the railroad. Dues are just $20 per year, which includes a quarterly newsletter. Members may help on the railroad in some ways, such as helping at public functions and helping visitors. You may find out more about The Friends on Facebook. Enough good cannot be said about the volunteer Friends Of The Stewartstown Railroad. They have been right in there helping to save and preserve the railroad. 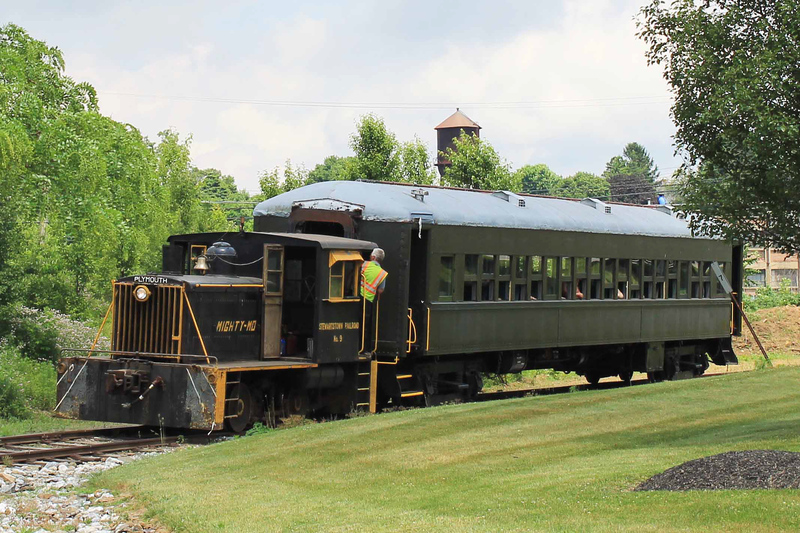 The Stewartstown Railroad offers rides to the public during different times of the year. Learn more on Facebook, Stewartstown Railroad Company. The railroad is also selling its official color photo calendar. The cost to have the 2018 Stewartstown Railroad calendar mailed lo you by first class mail, including tax, is $17.95. Mail your check or money order to: Stewartstown Railroad, P.O. Box 155, Stewartstown, Pa. 17363. It will be mailed to you immediately.